S eated, from left, are Jennifer Heath and Jamie Topp, West Virginia Northern Community College students using computer equipment purchased through a grant from the Martha Parlin Trust, administered at WesBanco, Wheeling. 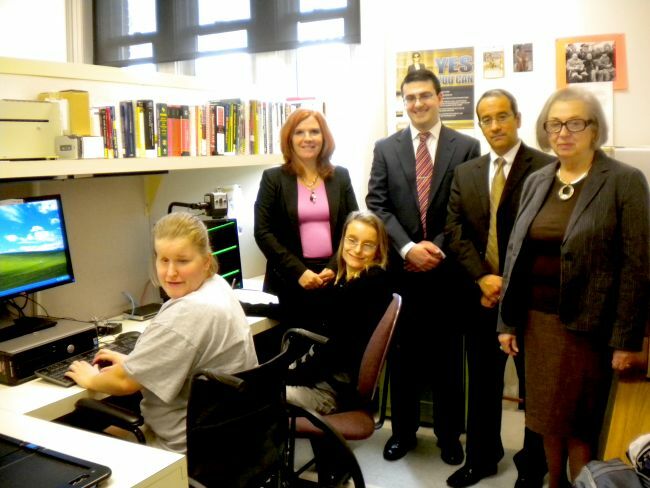 Looking on, from left, are Denise Wycherley, student disability coordinator at WVNCC; Anthony J. Habbit, AVP & senior trust officer, and Harold J.P. Migias, senior vice president, Trust and Investment Services, WesBanco; and Dr. Mary Marockie, president of the WVNCC Foundation Board of Trustees. A $10,000 grant from the Martha Parlin Trust has been awarded to provide equipment to visually impaired students at West Virginia Northern Community College. Harold J.P. Migias, senior vice president, Trust and Investment Services, at WesBanco in Wheeling, which administers the Martha Parlin Trust, said, “WesBanco appreciates the ability to continue Mrs. Parlin’s philanthropy through her trust by supporting programs” such as those offered at WVNCC. Types of equipment which the Martha Parlin Trust grant purchased, Wycherley said, included a talking calculator, which provides audio feedback to a user, along with an oversized LCD display. Also being used is MAGic Screen Magnification Software which increases the size of what is seen on a computer monitor and also speaks aloud the screen contents. This software impacts school research on the Web for projects such as report writing, spreadsheets and working with common office-related software. Wycherley explained the funds also were used to purchase the VictorReader Stream DAISY-MP3, which enables students to use a hand-held player that downloads books and other material and then have the text turned to speech. Also included is a built-in microphone to record voice classroom notes.